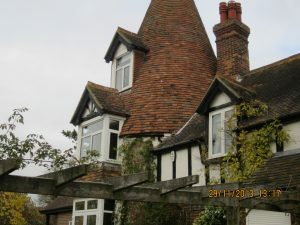 Following our clients instruction, one our Property Care Association) qualified damp and timber surveyors attended the Oast House in Hollingbourne, Kent to carry out an inspection and test some of the walls for damp. Moisture readings were taken to the surface of the walls, using a Protimeter Survey Master damp meter in measure mode, which recorded high levels of moisture to the base of some of the walls. Following the survey our client was issued with our usual detailed report, together with our floor plan and recommendations to eradicate the Rising Damp. On receiving instructions our experienced and trained operatives attended the property and removed the specified damp wall plaster, which was taken to a designated place for disposal. A pattern of holes were then drilled into a chosen mortar joint at the base of the walls and cleared of brick dust. These were then injected with a Silane/Siloxane cream damp roof solution to form an impervious barrier to prevent damp rising. The walls were then prepared and replastered strictly in accordance with our damp proof plastering specification, prior to fitting new treated timber skirting boards and priming ready for our client to decorate. However, our client was advised, as all our clients are, that initial decorating can only be carried out, three weeks after plastering, using two mist coats (watered down coats) of a ‘Trade’ emulsion paint which doesn’t contain vinyl. This is important to allow the wall to breathe and dry out properly. We have been established for over 46 years and have many thousands of happy clients, some of which have made us a 5 star Which Trusted Trader, All damp proofing and Wood Rot eradication carried out by us is covered by our 20 year guarantee and can be protected by Guarantee Protection Insurance Ltd. Damp proofing is specialist work and should only be carried out by a reputable company such as Tapco HomeDry. Compromise shouldn’t be considered, call us first.